Sticky Toffee Kitchen Dishcloths are made of durable, high quality cotton terry that produces a strong, thick dishcloth to assist with all your kitchen needs! These dishcloths measure at 12 in x 12 in. They are machine washable and dryer safe ensuring you easy care. Cotton terry is long-lasting and durable for many washes. Our collection of eight includes 4 solid colored dishcloths and 4 classic striped dishcloths available in a variety of colors to coordinate with any kitchen décor. Designed with a popcorn terry construction, these dishcloths are highly absorbent. 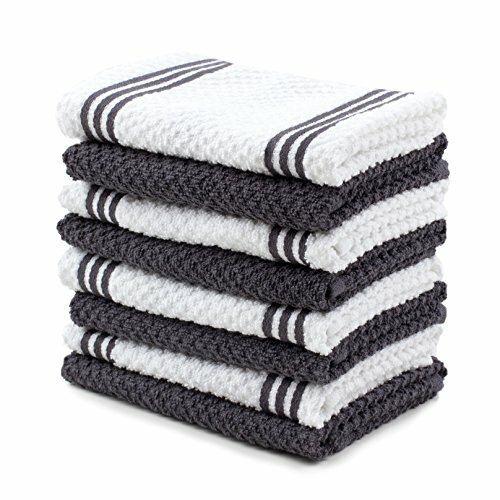 They are perfect for drying, cleaning, scrubbing or achieving any other household task. Decorated with charming, chic packaging, these dishcloths make a great hostess, wedding or housewarming gift! If you have any questions about this product by Sticky Toffee, contact us by completing and submitting the form below. If you are looking for a specif part number, please include it with your message.